Hotel "Dune" is located at the sea in 2-3 minutes. 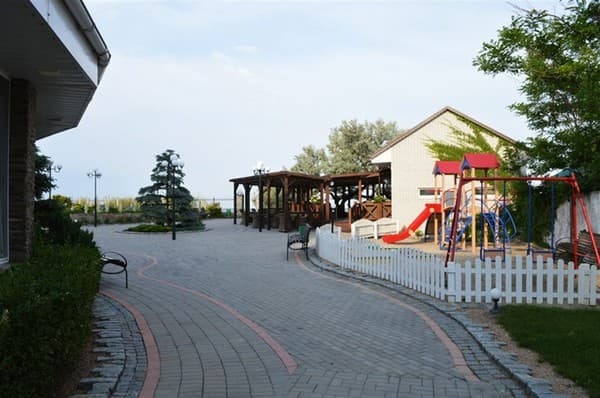 walk, in a quiet cozy corner at the base of the Berdyansk spit, in the recreation zone of the sanatorium "Berdyansk". 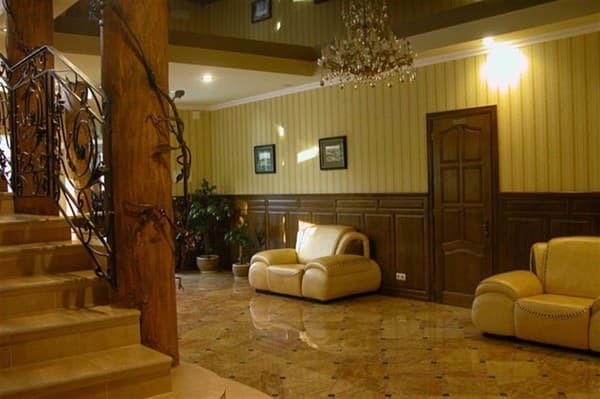 It offers accommodation in a 4-storey new building in comfortable rooms of various categories. There is a private beach (sandy, equipped with sun beds and umbrellas), to which only 30-40 m. Refreshing and swim can also be in the pool under the open sky. 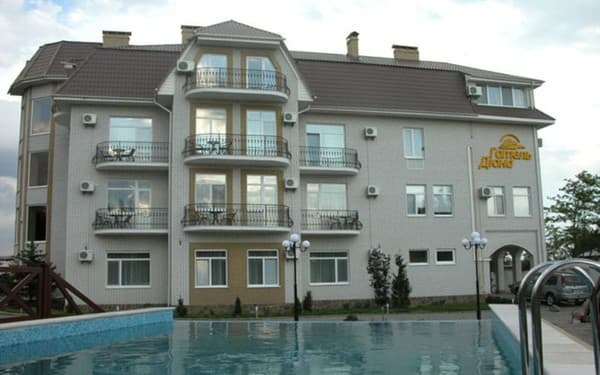 The guests have a restaurant on the ground floor, a sauna with a swimming pool, a tennis court, billiards, a conference hall, a parking lot and a children's playground. Breakfast is included in the price, in addition - in the bar and restaurant according to the menu. Aquapark Cape of Good Hope is 5-10 minutes away from the hotel, near the open zoo. The center of Berdyansk is 15-20 minutes away. Distance to the bus station - 6.7 km, to the railway station - 6.9 km. 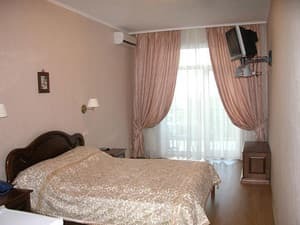 Description of the room: Cozy room with a double bed or 2 single beds, air conditioning, hairdryer, refrigerator, bathroom, balcony, mosquito nets. 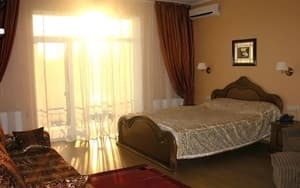 Description of the room: Cozy one-room with everything necessary for comfortable living: double bed or 2 sesquioxides, air conditioning, hairdryer, refrigerator, balcony with furniture, mosquito nets. Description of the room: Cozy studio-type room. The room has a double bed, air conditioning, refrigerator, hairdryer, bathroom, balcony with furniture, mosquito nets. There is a possibility of placing on an additional place. Description of the room: Spacious studio-type room. The room has a double bed or 2 single beds, air conditioning, refrigerator, hairdryer, bathroom, balcony with furniture, mosquito nets. There is a possibility of placing on an additional place. 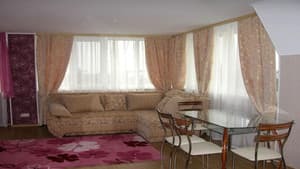 Description of the room: Spacious 2-room apartment with sea view. The room has a double bed, sofa, air conditioning, refrigerator, hairdryer, bathroom, balcony with furniture, mosquito nets. 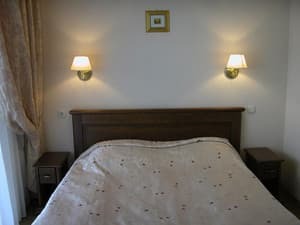 Extra bed is 250 UAH / day (breakfast is included in the price, children under 12 years old receive an extra bed - 200 UAH per day (adult breakfast). Children under 3 years without a seat are free of charge (children's breakfast). The hotel has a cafe, where you can order meals from the menu. 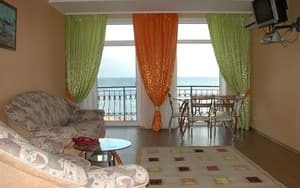 The hotel is located by the sea, in a quiet cozy corner at the base of the Berdyansk spit, in the recreational zone of the sanatorium "Berdyansk". To the beach 30-40 meters. The water park "Cape of Good Hope" is 5-10 minutes away from the hotel, and near the open zoo. The center of Berdyansk is 15-20 minutes away. Distance to the bus station - 6.7 km, to the railway station - 6.9 km. The possibility of year-round acquisition of courses in the sanatorium "Berdyansk". The medical base is located near the hotel. From the railway station by shuttle bus № 5/2 to the final stop or by taxi.